Each year during the Christmas holidays, the city of Salerno organizes its unique Le Luci d’Artista event with light shows and installations along the streets and public squares, creating a magical atmosphere and attracting thousands of visitors. Here is some important information to organize a trip to see the Luci d’Artista di Salerno. When is the Luci d’Artista in Salerno Held? This year, Le Luci d’Artista will be held from 9 November, 2018 to 20 January, 2019. The theme is marine life, and the light shows will including waves with fish, shells, and creatures from the seas, creating an overall effect of an acquarium of lights. 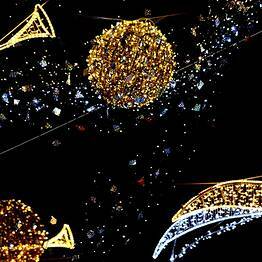 The light installations are turned on each evening at sunset and stay on late into the night, together with traditional Christmas markets on the Lungomare Trieste waterfront and in squares throughout the city. The panoramic ferris wheel, towering 60 meters above the city, will be inaugurated on 11 November in Piazza della Concordia. The main Christmas tree marks the center of Piazza Portanova and is 30 meters high; lights will be turned on the 1st of December. In keeping with the marine theme, for the first time this year visitors can see Nativity scenes sculpted out of sand in Piazza della Concordia from 8 December, 2018 to 6 January, 2019 during the Sand Nativity exhibition. The easiest way to reach Salerno is by high-speed train. The Salerno train station is in the center of town, and all the light installations are an easy walk away. If you are arriving by car, remember that can be hard to find parking during the Luci festival, and there is heavy traffic in the town center. The best option is to park at the Stadio Arechi (the stadium located at the highway exit), and take the subway or a city shuttle bus to the center from there. The subway and shuttle buses run until late into the night. What is the Best Itinerary to See all the Installations during Luci d’Artista? The installations are located throughout the town of Salerno, so it's impossible to see them all on a single day trip. The best option is to stay overnight in Salerno so you have time to explore a number of different neighborhoods. Leave from the train station in Piazza della Concordia, where the subway trains and shuttle buses from the Arechi parking lot also drop off passengers. Walk along Corso Vittorio Emanuele, the main shopping street, to Piazza Portanova, where there is a large illuminated Christmas tree. From here, continue through the Medieval center of town along the historic Via dei Mercanti. Take a side trip to see the Duomo di Salerno and the Temple of Pomona before returning to Via dei Mercanti and walking to Piazza Largo Campo, the heart of the city's nightlife. Once you leave the historic center of town, you will find yourself at the Villa Comunale public gardens, where each year a magical "giardino incantato" is created. You can finish your walk by returning along the waterfront, stopping to shop at the Christmas market before ending your visit in Piazza Flavio Gioia. There are a number of “street-food” stands in the center, selling cones of fried seafood, slices of pizza, and fried treats. Staying a night or two in Salerno is an excellent idea during the light festival, giving you time to visit the installations and the main sights in the city and even take a side trip to the Amalfi Coast. There are a number of new and renovated hotels in town, though we recommend avoiding the busiest roads in the historic center, which can be noisy during the holiday weekends.